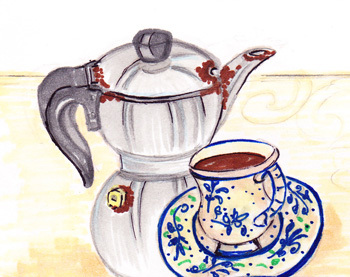 Have you ever had leftover coffee in your coffee pot, or brewed coffee you did not have time to drink all to the end? Yes, I did. I drink only espresso coffee and if don’t finish the entire pot, I don’t want it anymore. Espresso, like any other coffee, to taste good must be fresh brewed or nothing, but I don’t like to throw away good stuff, there is always a good use for coffee. Place it in a glass jar and let it rest in the refrigerator. At the end of the week, in my house it is time for ragout, generally meat ragout, which will be part of the Sunday meal and one more meal during the week. Ragout tastes good when it contains mixed pieces of meat, chicken, lamb, pork, beef, sausages and everything of your liking. All the meat pieces are lightly floured, sautéed and browned on all sides in olive oil. After this first easy step, the meat goes in a platter to rest. A triad vegetables all chopped up, such as carrots, onions and celery will be added to the same oil until almost translucent, the meat returns to the pot together with the vegetables, simple seasons like basil, thyme and sage, saute’ for a few more minutes, then the ragout gets happy with the addition of any red wine. Let the alcohol evaporate, add two large cans (16-20 oz. or more depending on the quantity of the meat) of peeled tomatoes and let it simmer covered for about one hour. Now is time for coffee. Before the cooking is completed, add one cup of left over coffee not sugared and let it simmer for 15-20 minutes more. That coffee not only will add a higher dimension of flavors to the ragout, but it will really wake up the meat with a kick. Another application of coffee is after searing a steak. If you want to have some juicy gravy, add left over coffee not sugared after the steak has been seared on both sides and has beautiful grilled marks showing. The coffee will mix with the natural juice of the steak to produce that special gravy, which is so tasty and can be used as a flavor for potato purée. Don’t forget to season the steak after the addition of coffee. Sweets are delicious with left over coffee. Beat ricotta to a cream, add sugar and cinnamon to you liking, then a half cup of leftover coffee, mix well. Serve in a dainty glass with Italian biscotti, crumbled or whole. It is a simple and super fast dessert everyone will like. Now, this dessert will wake you up and give you the energy for a few more hours of work if you need to. It is a good custom to stop a work activity around 3:00 pm for a little boost. Valentina Cirasola is an Italian interior designer with a passion for kitchen and cooking. She loves to remodel homes and loves to turn ugly spaces into castles, but especially loves to design kitchens and wine grottos.